Series 140S, 140X Automatic Reseating Temperature and Pressure Relief Valves are used in commercial water heater applications to provide automatic temperature and pressure protection to domestic hot water supply tanks and hot water heaters. 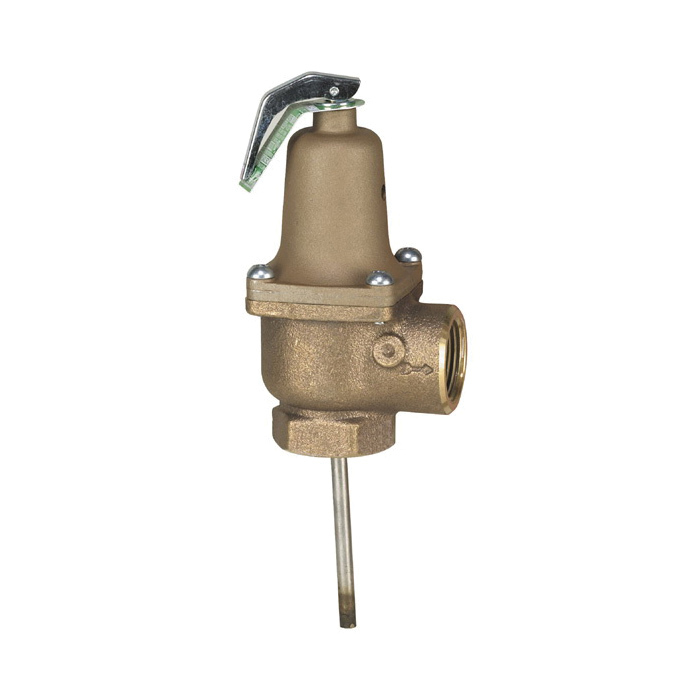 They feature a bronze body with NPT female inlet and NPT female outlet connections, unique thermostat with special thermo-bonded coating (3/4 in., 20mm) or stainless steel thermostat (1 in., 25mm), tamper-resistant bonnet screws, automatic reseating feature, and test lever. Model 140S has a short thermostat for installation directly in available tank tappings. Model 140X has an extension thermostat for installation in the hot water outlet within the allowable distance from the top of the tank. Series 140S, 140X valves are ASME rated and CSA listed. Temperature Relief: 210 deg F (99 deg C), Pressure Relief Range: 75 to 150psi (5.2 to 10.3 bar), Standard Pressure Settings: 75, 100, 125, or 150psi (5.27, 7.03, 8.79, or 10.55 bar).